Vitamin A, a fat-soluble vitamin, was the first vitamin to be “officially” termed a vitamin, hence the designation of “A”. It is also known as the “anti-infective” and “anti-ophthalmic” vitamin. The two forms of Vitamin A that are most familiar are Retinol and Beta-carotene, but more varieties do exist. Retinol is found in animal sources such as fish oils and liver. When consumed, the body can utilize this form immediately. For this reason, it is often referred to as the “true” Vitamin A.
Beta-carotene is found in vegetables. When consumed, it must be converted into retinol in order for the body to be able to utilize it. For this conversion to take place, the body needs the enzyme beta-carotene dioxygenase, as well as fat and bile. Since the body must go through steps before it can utilize this form of Vitamin A, it is referred to as “Provitamin A”. 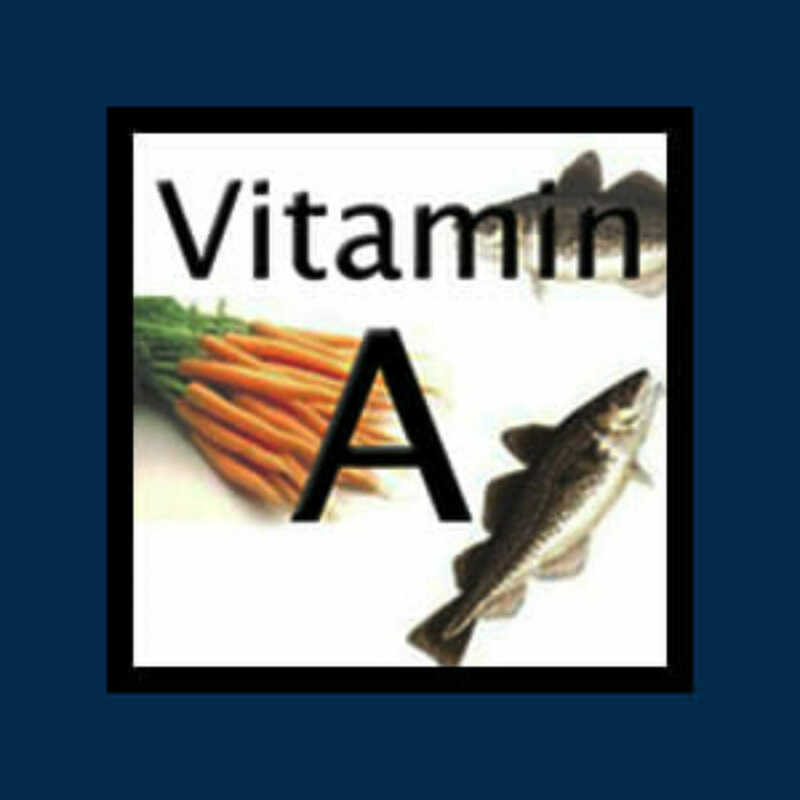 Why do you need Vitamin A? An important issue surrounding Vitamin A relates to diabetics and those with thyroid conditions. Many diabetics believe that they are making a “healthy” choice by attempting to meet their Vitamin A requirements by consuming vegetables containing beta-carotene. However, remember from above, that beta-carotene needs to be converted into retinol and that a specific enzyme (beta-carotene dioxygenase) must be present for this conversion to occur. Unfortunately, this important enzyme is lacking in diabetics. Thus, they might not be meeting their Vitamin A requirements. It would stand to reason then, that diabetics should take Vitamin A in the form of retinol to prevent night blindness, deterioration of the arteries (which could lead to a stroke or heart attack), skin disorders and other degenerative conditions that are often associated with diabetes. The case is a bit different when it comes to people suffering from thyroid conditions. Vitamin A is extremely important for the thyroid gland. Without sufficient amounts, the ability to produce thyroid-stimulating hormone (TSH) is compromised resulting in hypothyroidism (low thyroid function). Retinol must be present in order for the thyroid gland to absorb iodine which is vital for thyroid function. People with hypothyroidism, much like those with diabetes, have a reduced ability to convert beta-carotene into true Vitamin A (retinol). So if these individuals attempt to get Vitamin A via beta-carotene, this could prove to be a losing battle. The research surrounding Vitamin A is quite extensive, and many studies have shown that supplementation of Vitamin A in high doses can significantly improve or prevent many dangerous illnesses and conditions. This is where the controversy takes hold. At what dose does vitamin A become toxic? There are apparently two different schools of thought. The first believes that vitamin A (retinol) is toxic. If you are of this thinking, then the maximum dosage of Vitamin A (retinol) is 5000 IU. With this in mind, vitamin A is often recommended in the form of beta-carotene. (Hopefully, your body can convert it to retinol.) Keep in mind also that only a small percentage of beta-carotene actually becomes retinol, so higher dosages in the range of 20,000 IU are required for this form. The second believes that vitamin A (retinol) is not toxic when in a natural form such as in fish liver oil. There is much evidence that when retinol is taken in a ratio with vitamin D (also in its natural form such as in fish liver oil) then retinol is not toxic. Now whether you believe vitamin D is toxic is another topic. You can refer to ‘Is Vitamin D toxic?’ for more on this subject. Did you know that dosages ranging from 100,000 to 300,000 IU of vitamin A (retinol) have been successfully used in the treatment of many health conditions without toxicity? That being said, more common dosages range from 10,000 to 100,000 IU of Vitamin A from sources such as fish liver oil, along with vitamin D (also from fish liver oil). Important to note: Synthetic Vitamin A is Toxic in any form or dosage! Just as with Vitamin D, there is much controversy regarding Vitamin A toxicity. And just as with Vitamin D, the toxicity myth was debunked by research! For an in-depth look at the issue of Vitamin A toxicity, you can refer to Is Vitamin A (Retinol) Really Toxic?